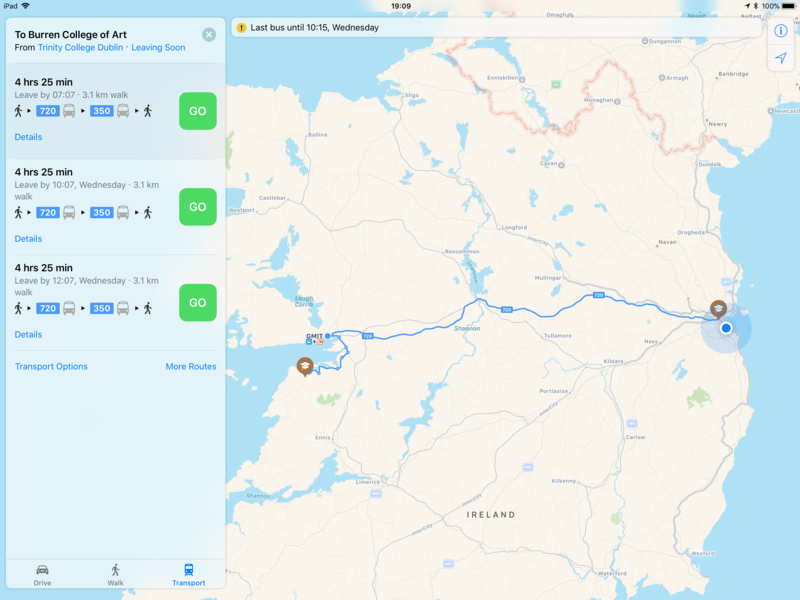 Apple has introduced public transit directions for Maps users in Ireland, confirming recent signs that it was about to do so. Coverage may not be universal, but so far seems to apply to major cities like Dublin, Cork, and Kilkenny. This includes local bus and train systems, such as Dublin Area Rapid Transit. Apple's launch coincides with the landfall of Hurricane Ophelia, which has killed one woman in West Waterford and left some 120,000 Irish homes without power. Many transit systems are closed as well, making the Maps upgrade irrelevant for many people until later this week at the earliest. Hints that transit directions were coming first emerged last month, when users pointed out more detail around train stations. Similar enhancements were a precursor to transit options for Japan in iOS 10. Prior to Ireland, the most recent country to get transit in Maps was Taiwan. In the U.K., Apple Maps vans should now be touring Fort William in Scotland, and Bridgend County Borough in Wales. Their purpose is unclear, since there's no equivalent of Google Street View in iOS 11 or macOS High Sierra, and the company has been mum on details beyond wanting to "collect data which will be used to improve Apple Maps." Just been checking it out. It even includes a small company where I live with only three local routes. An impressive start! Off topic but as a Floridian my heart felt wishes that the storm damage is soon cleaned up. It’s actually pretty impressive and seems to cover most of the country. in Dublin, it covers the “Luas” light rail lines too.